This excellent, well presented exhibition, featuring well-loved toys, treasured family gifts and tiny outfits belonging to nine generations of royal children is now open at Buckingham Palace. Coinciding with the annual Summer Opening of the State Rooms, Royal Childhood brings together more than 150 objects relating to 25 children, from the future George IV to Prince George of Cambridge, set against a backdrop of previously unseen photographs and private film footage. It gives an unprecedented glimpse into life as a young member of the royal family over 250 years. Magnificent Buckingham Palace has been a royal family home since George III purchased Buckingham House for his new wife Queen Charlotte in 1762. In 1845 Queen Victoria commissioned a fourth wing to be added to the Palace to provide ‘accommodation for our little family, which is fast growing up’ – she had nine children. In 1936, at the age of ten, Princess Elizabeth moved into the Palace with her parents, King George VI and Queen Elizabeth, and younger sister Princess Margaret. She returned to the Palace as Queen Elizabeth II in 1952 to raise her own family – Prince Andrew and Prince Edward were born there. For crowds gathered to await news of a royal birth, the Palace is a focal point for celebrations. The official announcement of a birth in the direct line of succession is displayed on the Palace forecourt. The announcement of the birth of Prince George of Cambridge at 4.24pm on 22 July 2013 was displayed on what must now be the world’s most famous easel – it even had its own Twitter handle. The easel and one of the two original copies of the announcement are on display in the exhibition. The Music Room has been the setting for the christenings of Prince Charles, Princess Anne, Prince Andrew and Prince William. The spectacular silver-gilt Lily Font, commissioned by Queen Victoria for the christening of her first daughter Princess Victoria in 1841 and used at almost all major royal baptisms since, is displayed in the Palace’s Music Room, alongside the silk-satin and lace christening robe worn by Prince George of Cambridge – a replica of the original royal christening robe commissioned by Queen Victoria. A cake inspired by the one made for the 1853 christening banquet of Prince Leopold, Queen Victoria’s eighth child, is displayed in the State Dining Room. The progress book of Princess Elizabeth, the future Queen, documents the Princess’s first outing at just ten days old into the garden of her home at 17 Bruton Street, her first tooth (26 January 1927), and the moment she began to crawl (11 April 1927). Queen Victoria herself kept the first teeth of her children, wrapping them in tiny paper parcels inscribed with the date and the child’s name. 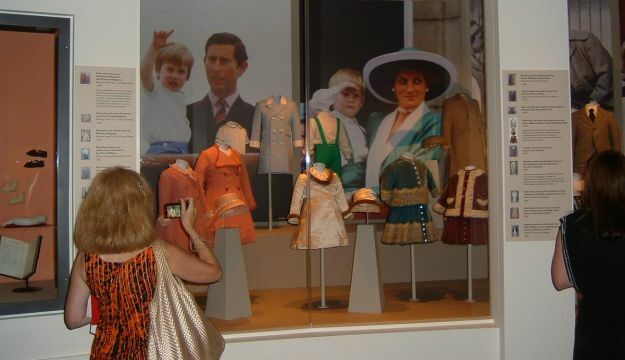 Miniature outfits worn by royal children are also on display, including a dress belonging to Queen Victoria at the age of 11, the ‘walking suits’ of King George V, a beautiful satin coat and hat worn by Princess Margaret, and a soldier dressing gown belonging to the three-year-old Prince Harry. A glittering fairy costume worn by Princess Anne reflects a common childhood love of dressing up. In the Palace’s Ballroom, there is a spectacular four-metre-tall display of childhood toys, from a child-sized, donkey-drawn barouche used by Queen Victoria’s grandchildren to pedal cars and a wooden ‘rollercoaster’ enjoyed by The Queen’s children. Alongside a miniature caravan given to Prince Charles and Princess Anne is a tiny replica of the DB5 used by James Bond in the films Goldfinger and Thunderball. Presented by Aston Martin to Prince Andrew at the age of six, it is fully mobile and includes rotating number plates, a pop-up bullet-proof shield, a working smoke screen and electric water jets hidden in the rear reflectors. Among the more recent gifts presented to royal children is a rocking horse given by President Obama and Mrs Obama to mark the birth of Prince George. Handmade in America, it has the Presidential Seal on the saddle, a personalised plaque, and is accompanied by a special polo mallet, the head of which was carved from the branch of an oak tree that once stood on the South Lawn of the White House. Other objects on display include the handwriting practice book of the five-year-old future George IV from October 1767, Prince William’s geography exercise book from 1987 and a blue glazed bowl made by Prince Harry at the age of 11. Royal Childhood is part of a visit to the Summer Opening of the State Rooms at Buckingham Palace, 26 July – 28 September 2014. Enjoy a leisurely day out at Buckingham Palace and combine a ticket to the State Rooms with a guided tour of the most remarkable features of the famous garden. The Garden Highlights Tour includes the beautiful Herbaceous Border, the wisteria-clad summer house and Rose Garden, the enormous Waterloo Vase and the Palace tennis court, where King George VI and Fred Perry played in the 1930s. The 39-acre garden is today the setting for The Queen’s Garden Parties. Described as ‘a walled oasis in the middle of London’, it boasts more than 350 types of wild flower, over 200 trees and a three-acre lake. Between the audio tour of the State Rooms and the guided tour of the garden, the itinerary allows time for your group to take in the panoramic view of the lawn from the Garden Café and to visit the Garden shop. Adult £26.00, Over 60/Student (with valid ID) £23.40, Under 17 £15.60, Under 5′s free. Price includes an audio tour of the State Rooms in nine languages and a guided tour of the garden in English. Allow plenty of time after your tour to relax in the peaceful Garden Café, overlooking the famous lawn and lake. Enjoy a lovely selection of refreshments including hot and cold drinks, sandwiches, cakes and delicious strawberry and cream scones.